The tenth Permaculture design principle is ‘Edge Effect’ – the use of edge and natural patterns for best effect. This design principle is concerned with increasing diversity and productivity in our systems by emulating the ecological phenomenon known as the “edge effect”, and the patterns found in Nature. To understand this design principle, first we will explore the edge effect as it relates to Permaculture design, and then look at how we can incorporate the patterns of Nature into our designs to make our systems more efficient and productive. The edge effect is an ecological concept that describes how there is a greater diversity of life in the region where the edges two adjacent ecosystems overlap, such as land/water, or forest/grassland. At the edge of two overlapping ecosystems, you can find species from both of these ecosystems, as well as unique species that aren’t found in either ecosystem but are specially adapted to the conditions of the transition zone between the two edges. For the sake of clarity, we must first define some key ecological terms. An edge is the boundary or interface between two biological communities (e.g. forest and grassland) or between different landscape elements (e.g. land and water). An ecotone is the transition zone along the edges of two adjacent ecological communities, where one ecological community meets the other (e.g. the area between forest and grassland). The transition from one ecosystem to the other can be a very gradual or a very sharp one. In this example, each ecosystem, labelled A and B, contain only three species, coloured red, blue and yellow. Ecosystem A contains 3 species represented by squares and ecosystem B has 3 represented by circles. In the region where they overlap, called the ecotone, there are red, blue and yellow squares and circles. 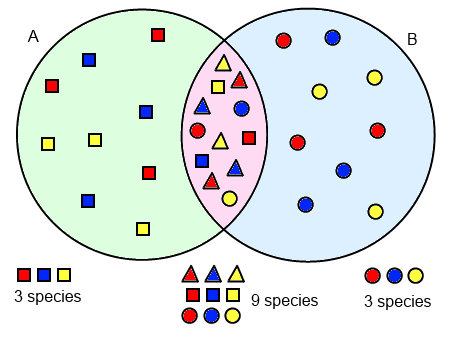 The combination of squares and circles (which represent six species) produce unique conditions which can now support three new species, represented as red, blue and yellow triangles. So, while ecosystems A and B each contains three species, the overlapping transition zone contains nine. This increase of diversity that results from ecosystems overlapping is known as the edge effect. The ‘edge effect’ – Where two ecosystems overlap, the overlapping area supports species from both, plus another species that is only found in the overlapping area. Resources from both ecosystems can be accessed in the one place. Conditions such as air temperature, humidity, soil moisture and light intensity levels all change at edges. Variations in the conditions at the edges can create favourable microclimates which can support unique species. Increased availability of light to plants along the edges allows more plants to be supported (greater diversity) and increases productivity. Increased plant diversity increases herbivorous insects, which increases birds, and ultimately predators. Ecosystem edges and borders act as ‘energy nets’ or sieve, capturing the massive movement of materials, nutrients and energy across their boundaries – leaves and soil are blown by the wind against barriers, shells wash up on the beach, etc. Adjacent ecosystems are connected via flows of energy, material (nutrients) and organisms across their boundaries, and these flows can exert strong influences on the fertility and productivity of ecosystems. It is important to note that the environmental conditions at the edges of ecosystems usually different from those deep within the ecosystems themselves. The increased productivity and diversity resulting from the edge effect is clearly observable in Nature. Mangrove ecologies (land/sea interface) and reef ecologies (coral/ocean interface) are some the most highly productive natural systems. Riparian areas (the banks of rivers and streams) are very rich in biodiversity. Traditional human settlements are usually located at the highly productive transition zones between ecosystems, such as alongside rivers, estuaries or ocean, between foothills and plains, the outskirts of forest, or any combinations of these. As we have seen, edges serve as the interfaces of ecosystems, and these borders are much more productive and rich in life. There is a greater number of mutually beneficial relationships between the elements at the edges. Edges serve as ‘energy traps’ since they are the points where materials, nutrients and organisms flow across ecosystems, and there is increased cycling of materials and nutrients at the edges. The edges of ecosystems are very important in supporting biodiversity and in the production of biomass. We can take advantage of the natural phenomenon of the ‘edge effect’ to increase the productivity and yields of the systems we design. We bring this about by increasing the available edge in our designs. The way we increase edge is by looking to the patterns of Nature and emulating these patterns in our designs. Nature has evolved to be as efficient as possible over hundreds of millions of years, and we curiously find that in Nature’s designs there are no straight lines in Nature, but a variety of patterns which we see repeated throughout. So, let’s have a look at Nature’s patterns that allow us to arrange elements more efficiently! 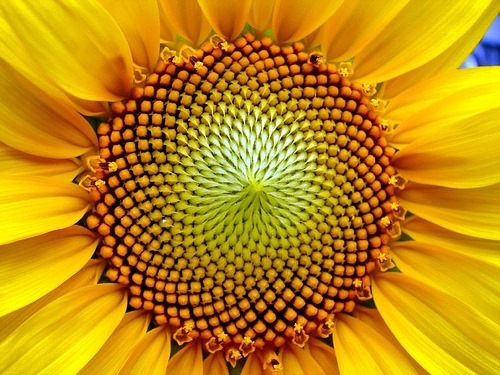 When we look to Nature, we find similar patterns repeated through all forms of life. These patterns are there not for aesthetic reasons, not just for looks, but because of the efficiencies they provide. Nature has perfected packing as much as possible into small spaces and optimizing the organization of things. In many natural systems, the surface areas that serve as interfaces to the surroundings are maximised by increasing edge through patterns. A lobular (having small lobes) or crenellated (having square indentations) edge provides more edge than a straight line. 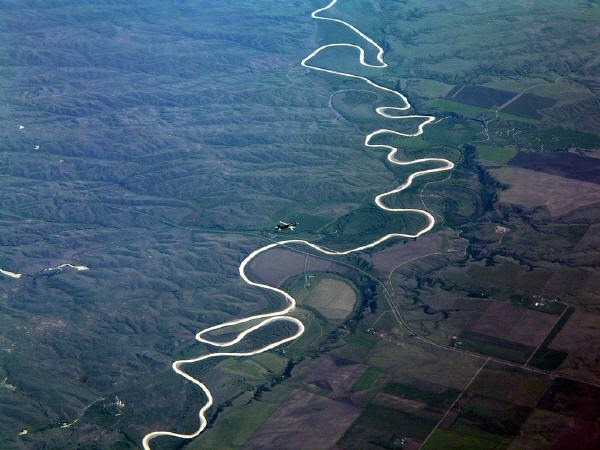 Rivers run winding courses through the landscape, which increases the water penetration into the land and creates a greater area riparian ecosystem than if they were running in a straight line. 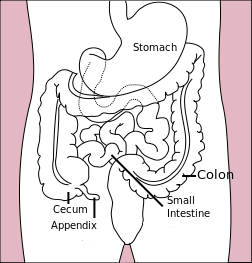 Similarly, the macrocosm pattern are reflected in the microcosm, our own intestines wind the same way to maximise the length, and therefore surface area, to absorb nutrients from the food we digest. We can still go further into the microcosm and find the same patterns. 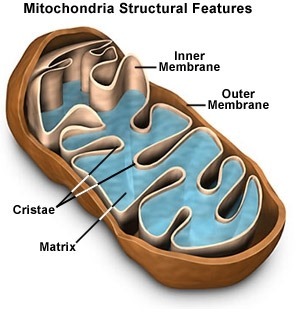 If we look inside the cells of living organisms, we find small structures called Mitochondria – oblong shaped organelles that are found in every eukaryotic (non-bacterial) cell. In the animal cell, they are the main power generators, converting oxygen and nutrients into energy. This process is called aerobic respiration and is the reason animals breathe oxygen. We can replicate this pattern in our designs to maximize the available edge. If we are building a pond for example, without changing the size of the pond, we can double the length of the edge (the earth/water interface), and therefore squeeze in twice as much productive plants around it. 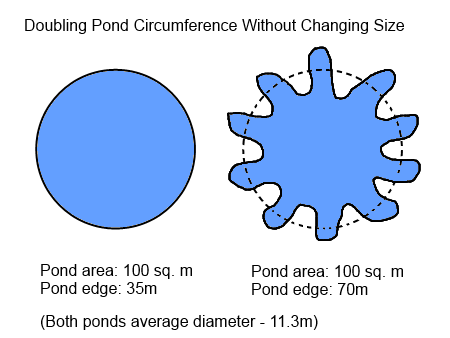 In the example below the mathematical calculations show how for a pond based on n 11.3m circle, we create 100 square metres for water surface, and by changing the edge from a straight one to a wavy, we can double the effective circumference. We can use the same principle in garden bed design. A wavy path through a garden gives us more edge to plant along, and more space to access the garden. We can increase the accessible space and edges in a garden using ‘keyhole beds’. A keyhole bed allows greater access into the garden beds without having to step into the soil, this preventing soil compaction, which hinders plant growth. The same concept can be applied at the next level down from garden beds, to the actual planting layout within the beds, to optimise the use of space and therefore increase yields. 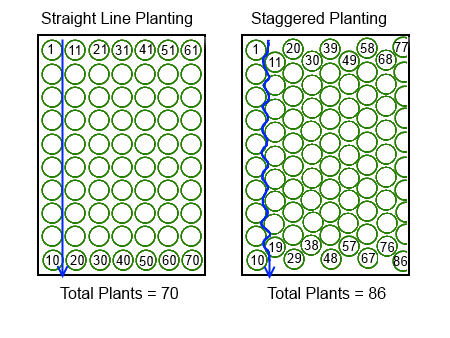 The circles indicate the space allocated for each plant, so the plants remain the same distance apart in both cases. If a circle is 15cm (6”) wide, then the plants in both arrangements are always this distance apart from each other. When we change the planting arrangement from straight to ‘wavy’, we can increase the amount of plants in our garden bed in this example from 70 to 86. This is the basic principle behind the system of Edge Cropping, where two crops are planted in alternating strips, i.e. rows of wheat with rows of lucerne between them, or corn with soybeans. The strips can be planted in ‘wavy’ lines to maximise the use of space and put more plants into a given area. Such a system is also more commonly referred to as Strip Intercropping, where multiple crops are grown in narrow, adjacent strips, that allow interaction between the different species, but also allow management with modern equipment. This is adaptation of the basic system of intercropping to contemporary, mechanized agricultural practices. Intercropping is the practice of producing multiple crops in a given space. Throughout time and around the world, intercrops have been used to better match crop demands to available sunlight, water, nutrients, and labour. The advantage of intercropping over sole cropping (growing a single crop in a field) is that competition for resources between species is less than exists within the same species. A zigzag pattern for a fence makes it more wind resistant and less likely to be blown over. Pitted edges, similar to a waffle iron, can be used in dry climates to trap wind-blown debris, organic matter, water and seeds. 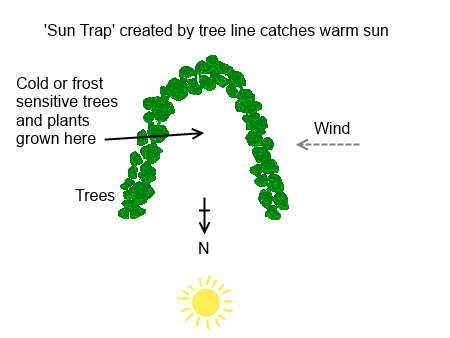 A ‘sun-trap’ can be made using sharply curved boundaries to protect plants from the wind and maximise heat. 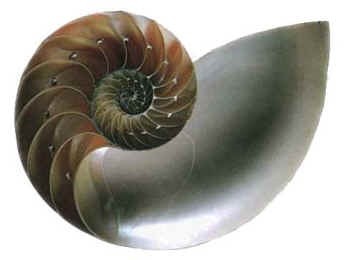 A spiral is another pattern that occurs frequently in Nature, and this shape can also be used to increase the amount of productive edge we have to work with. When we utilise the pattern of a spiral in our designs, we use the pattern in three dimensions, our spiral pattern can rise into the air rather than just sit flat on the ground. The most common application of this design technique is a Herb Spiral, as pictured below. The typical width of a herb spiral is approximately 1.6m (just over 5’) in diameter. 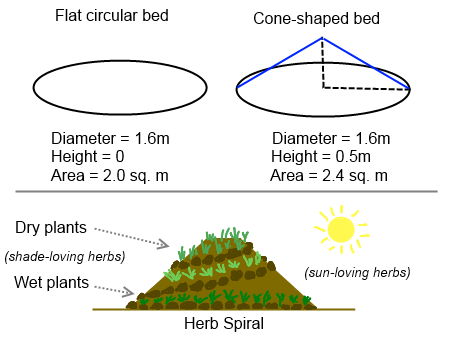 Using this size, we can see that a simple circular bed has an area of 2.0 square metres, but if we create a mound of soil 0.5m high, our area that we now have available increases to 2.4m. This represents a 20% gain in area. The higher the spiral (within reason), the more extra area we gain. The other advantage we gain with a herb spiral are the multiple microclimates that are created. The side facing the sun is warmer and the mound acts as a thermal mass, favouring sun-loving herbs and ones which need more warmth. The elevated design makes it possible to grow plants that dislike excessive soil moisture in areas that can become waterlogged. Through a single structure, we are able to garden vertically to increase the available edge, create multiple microclimates, increase yields and productivity, and add visual interest to the garden space. By increasing the edges in our designs, we extend the interfaces to the surrounding ecosystems, trap more energy and materials that move through our systems, and ultimately increase yields and productivity. 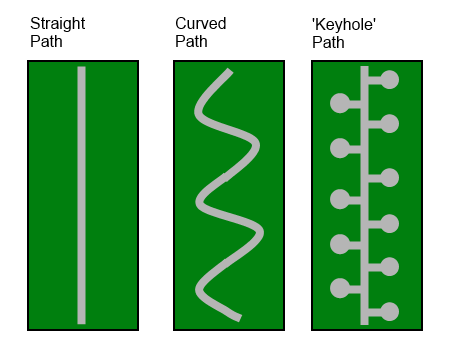 Edge patterns can take various shapes – they can be wavy, lobular or crenellated, zigzag or spiral. Elevated mounds as edges increase growing area, provide wind protection, improved drainage and create multiple microclimates. it is important that we select the most appropriate kind of edge patterns for our environment. Different systems will require different approaches, and the factors that we need to take into account when selecting the edge pattern are landscape, scale, climate and plant species. Small scale systems can support greater pattern complexity, while for large scale systems, it is best to keep the patterns simple to minimise the work required to build and maintain them. Now that we can emulate Nature’s patterns to optimise the efficiency of our gardens, we can have gardens that are more natural looking and aesthetically pleasing, and more productive too! Banks-Leite, C. and Ewers, R. M. 2009. Ecosystem Boundaries. eLS. I’ve really enjoyed this series so far – but the line above is irritatingly incorrect and often repeated. It doesn’t invalidate the rest of what you say, but Nature produces straight lines all of the time: have a look at the formation of many rocks and crystals which are often perfectly straight. Like I said, I’m enjoying what I read, it’s just that this is a pet peeve of mine. Thanks for your comments, glad you’re enjoying this series of articles. “we curiously find that in Nature’s designs there are no straight lines in Nature” – I guess I should be more specific about that. Obviously straight lines exist is Nature, but they only as small parts of larger patterns which are not straight, or parts of geometrical three dimensional shapes. Typically Nature doesn’t do rectilinear shapes, which humans seem to have a propensity towards. More specifically, living systems aren’t straight, nor are dynamic natural systems, because they serve a purpose or function, and need to be optimized for that function, and a straight line does not appear to optimal in living systems when we look at Nature’s preferences. Many mineral formations, which are static structures, in other words, they just sit there and do nothing other than hold together in a stable form, form interesting geometric shapes. For example, iron pyrite forms perfect cubes, calcite crystals are a rhombohedral in shape. These crystals often occur naturally in clusters, which are of unusual and irregular shapes, even spherical, with crystal formations lining the inside of a sphere. Keep in mind that these crystal formations aren’t optimised for any function, they are mineral elements frozen in a static stable form, unmoved and unchanging, until they interact with Nature’s dynamic forces, which will eventually release those minerals back into living systems. You also see straight lines in organic sub-structures as well 😉 Being a geo’s wife, who also sells rocks at markets I hear the ‘no straight lines, must be fake’ thing more than you could imagine. I agree with the principal for garden design though. If nothing else, it’s better for access and harvesting. I’d actually read about your Melbourne garden before I started reading this and didn’t realise it was the same person. I like the style you’ve written in; it’s broken down without being ‘dumbed down’ and is really easy to follow. Sorry for the typos- I’d blame my keyboard but it’s me that’s tired. I just acquired the lot next to mine. I am gonna build a couple of spiral mounds into the overall plan. The diversity and options available to me in this climate are endless! This site has changed my views on many of my long-established beliefs/traditions. It feels good to let go of ideas that are old and wrong. That’s not easy for and old guy! Yo-Yo Ma and The Goat Rodeo Brought me here. Thanks for the education. It would be really helpful to students such as myself if you guys left the name of the person that wrote the article along with he date it was posted for citations and references.